Competition in the ereader market is showing no signs of slowing down, and now 1Cross Tech is looking to put its own twist on the device, showing its Android-powered MID hybrid “ShuBook” device that opens up like a hardcover book: on one side is an Eink display, and on the other side is a smaller color touchscreen display and a QWERTY keyboard for text and messaging needs—and did we mention it flexes its Android muscles to offer mobile phone, Internet browsing, and document access? Although there’s no word on pricing or distribution, 1Cross was showing off the device at CeBIT. 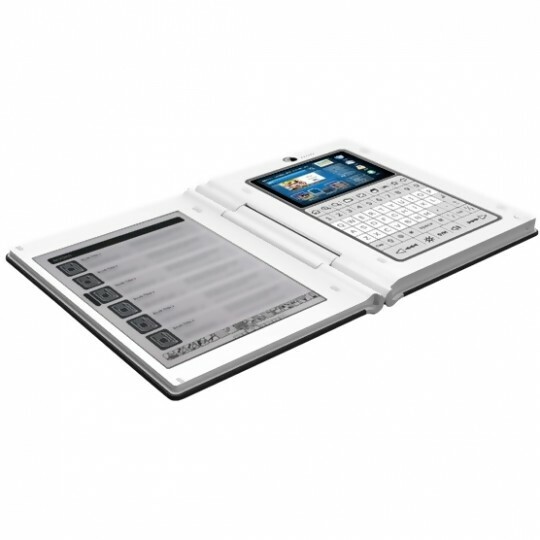 The ShuBook—that derives from Chinese for “book,” reportedly—carries a 6-inch 800 by 600-pixel Eink display on its left side along with a touch-enabled 480 by 320-pixel LCD TFT display on the other, along with a large QWERTY keypad. An API extension enables users to push content from the LCD display to the Eink display, enabling users to view PDFs and other documents in the larger Eink display—plus, since it’s Android, the ShuBook will be able to run a plethora of Android applications. 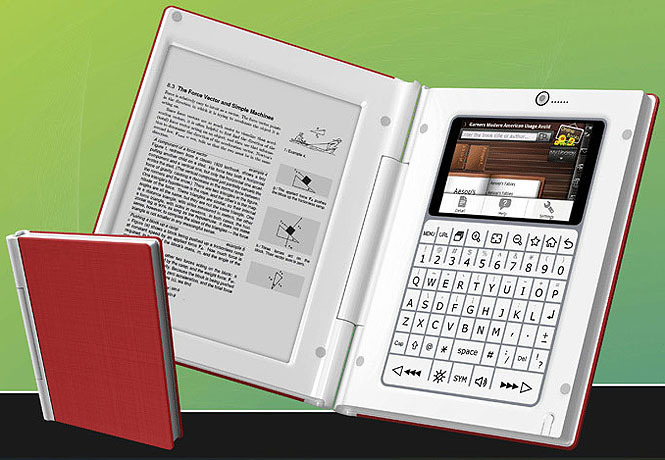 The ShuBook also sports a front-facing webcam for pictures and video chat, microSD storage, Wi-Fi and Bluetooth wireless networking, a motion sensor, and optional 3G connectivity. And when users are done, they can fold it up and tuck it safely away just like a real book. The ShuBook is raising eyebrows—and although the specs make the device look usable as a mobile Internet device (MID), some wonder how workable it would be as an ereader: although the hinge enables users to open the ShuBook all the way so the two displays are back-to-back, it’s not clear how workable an ereader with a full QWERTY keypad on its backside would be…or an Android device with an Eink screen flipped around behind it.